Imagine how much more effective dentists, surgeons, and jewelers–and anyone else who works their arms all day–could be with an appendage that never gets tired. Equipois thinks it can give you just that. Try holding your arm in front of you for 10 minutes. It probably starts to shake pretty quickly. Now imagine how much more effective dentists, surgeons, jewelers–anyone who holds out their arm all day for work–could be with an arm that never gets tired. Equipois, a company that manufactures tool support technology, thinks it can give you that arm. Equipois’s mechanical arm is inspired by the Steadicam, a stabilizing mount for motion picture cameras. “We asked if the same arm technology for the Steadicam could be used to hold tools that weigh too much for workers to hold comfortably,” explains Equipois CEO Eric Golden. Equipois already sells the zeroG mechanical arm (see the video below), which assists workers in manufacturing operations. “A worker can hold a tool and move it like they’re in space. It feels like it weighs nothing,” says Golden. But now the company is going one step further. 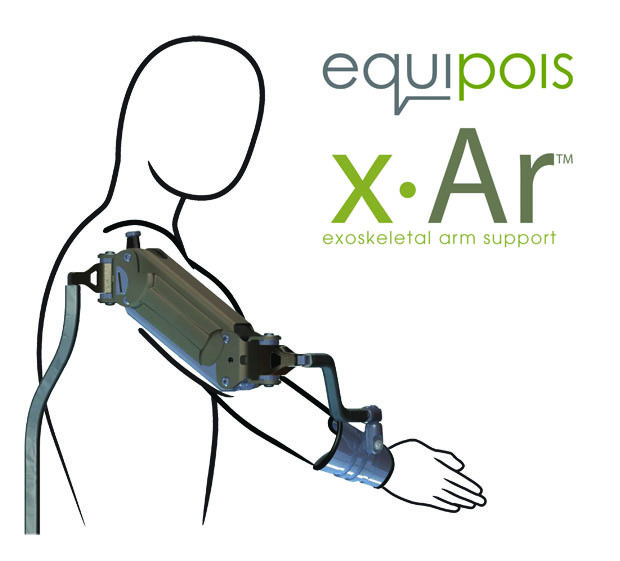 The latest iteration of Equipois’s technology, dubbed the “X-Ar,” for exoskeletal arm support, actually attaches to the arm (the zeroG attaches to the tools being used). The mechanically driven arm is so effective that a surgeon could, for example, perform operations for hours on end without experiencing any arm fatigue. And the applications for manufacturing are endless. you could have a 105 pound woman who happen to have great fine motor controls do it all day long,” says Golden. Eventually, the X-Ar could be used to assist paralyzed people in moving their arms. Golden hints that a brain-controlled interface could even be attached to the device. “We have met with some parts of the armed forces about helping brain-injured veterans. We’re a little bit away from kicking that off,” he says. But first, Equipois is focusing on getting the X-Ar out to people who work with their hands all day. The device goes on sale next month in the $2,000 to $3,000 range, with the first shipments expected to arrive by May. Note: This video shows the zeroG, not the X-Ar.